For more than 100 years, Colonial Candle has been burning brightly in the homes of America. Their candle story begins in 1905 with Mabel Baker, a former Massachusetts school teacher, who began making hand dipped bayberry taper candles in her tiny Cape Cod kitchen. The candles became so popular with family and friends that she started selling them in her husband’s local hardware store. By 1909, many stores in the Cape Cod area were selling Mrs. Baker’s candles and Colonial Candle was officially in business. 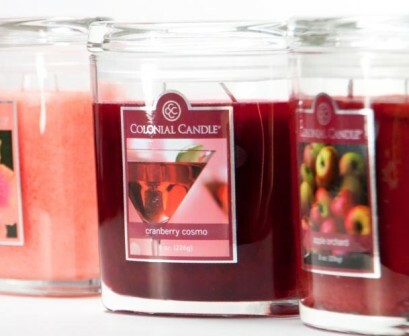 Recognized as the first candle company started by a woman, Colonial Candle is still proudly made in the USA. Today, all their candles are produced in North Carolina with the same pride and craftsmanship established over a century ago. From the mixing their fragrance with color and wax to the perfect wick, every candle is made to exact specifications. Their signature oval jars truly set Colonial Candles apart providing an understated sophistication and a cleaner, more even burn. Headquartered in Charleston, South Carolina, their Flagship Store is located in the Shops at the Charleston Place Hotel. You can also find these candles in local retailers all over the country. Fill your home with the fragrance of sticky cotton candy merged with lime blossom, vanilla, and musk. Warm Baltic amber with bergamot, jasmine and fresh tea leaves. A bright twist of clementine, cassis berry, grapefruit and juicy peach. A delicious raspberry confection whipped with notes of plum, exotic passion flower, and warm amber. Vanilla Bourbon is filled with the decadence of rich bourbon wrapped in creamy caramel and vanilla alongside dark woods and exotic floralcy. Transform your home into an enchanted forest of earthly fragrance that fills the atmosphere with accents of pine needles and balsam sap with Emerald Fir Scented Candle released for 2018 Winter Season. This candle's has the aroma of rich amber meets dark moss and black birch giving new depth to a festive environment. Snow Day scented candles is a sparkle of snow flurries glistens throughout the evening breeze. Winter amber and sun washed silk are wrapped with spun sugar. Mystical undertones of musk and pure coconut are nestled together with vanilla noir. Make your Halloween super happy with the aroma of a freshly carved pumpkin, enhanced by warm and inviting spices as well as the yummy sweet goodness of vanilla, pecan brown sugar and maple. A beautiful vanilla fragrance with the perfect touch of lavender. This vibrant fragrance combines the scents of fruity raspberries and blackberries, along with a tempting vanilla pastry drizzled with golden caramel. Delicious red apple baked with spiced rum, tahitian vanilla, whipped musk, and liquid amber. Cooling summer rain showers, freshly cracked coconuts, sliced juicy pineapple topped with sweet vanilla bean ice cream. Drink in the tropics. A perfect blend of robust coffee and sweet vanilla cream. Vanilla Cupcake from Colonial Candle smelled pretty authentic. The true test though is how it performed once the candle was burning. Did the fragrance stay true? Was it strong? Juicy Watermelon scent description - The ultimate summer refresher… the sweet cooling scent of juicy watermelon. Citrus Woods from Colonial Candle was pretty awesome and a fragrance I would purchase again in a heartbeat. It smelled like a fresh and citrusy masculine scent. Subtle yet soothing. I loved every second of it. An addictive blend of shimmering mandarin, tangerine zest, and golden plum. Papaya Punch from Colonial Candle turned out to be one amazing tropical scent. Not the classic coconut blend but more of a medley of sweet papaya, guava and luscious mango's. YUM!! Turbinado & Cream from Colonial Candle turned out to be one amazing vanilla fragrance. Imagine creamy buttermilk drenched in sugar. Calorie free but full of bakery goodness. I LOVED it!! Scent description for Cedar Mint - Rejuvenate with notes of eucalyptus leaf and garden herbs flowing over blue jasmine, amber crystals, and soothing sandalwood. Lemongrass & Cilantro scent description - A refreshing scent of lemon, mixed with armoise and sparkling bergamot. New Orleans French Quarter scent description - Step back in time and take a stroll through New Orleans' oldest neighborhood with exotic anise seed, sweet basil, and rich cedar. Apricot Mint - Colonial Candle scent description: A delicate botanical blend of lemon, juicy apricot, and crisp mint leaves. Mardi Gras - Colonial Candle scent description: Kick off the celebration with the exhilarating scents of bergamot, neroli, and the aroma of blonde woods. This festive scent is the next best thing to being there. 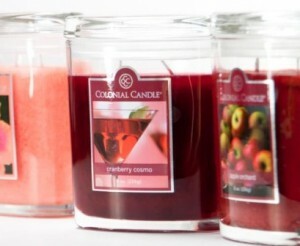 Scent description: A sweet medley of energizing berries and grape with a touch of deep rich port. Lisa is back!! It seems like forever but she's finally back and ready to start pumping out her awesome reviews she's soooooo great at doing!! This time around, she tried candles from Colonial Candle's new St Barths Collection.... a Destinations line. Christmas is in the air and what better way to celebrate it that with some Christmas scents from Colonial Candles?! Julia reviewed Gold Frankincense and Myrrh, Holiday Sparkle and Leather... Merry Christmas candle lovers!! Lisa's back and decided to try a big named brand called Colonial Candles! In this review, Lisa tried two brand new scents recently added to their scent selection, Pink Champagne and Vanilla Frosted Cupcake... YUM!!! !